I’ve got a few papers due within the next couple weeks. I could easily finish all three during Thanksgiving Break- but I obviously wont. Thanks! Comic Strip Spellcheck only works on speech bubbles. College seems to be spelt fine. The ‘C’ is just covered up by the dudes arm. It could be any number of canned red-colored beverages…. Yep. Definitely going through this right now. 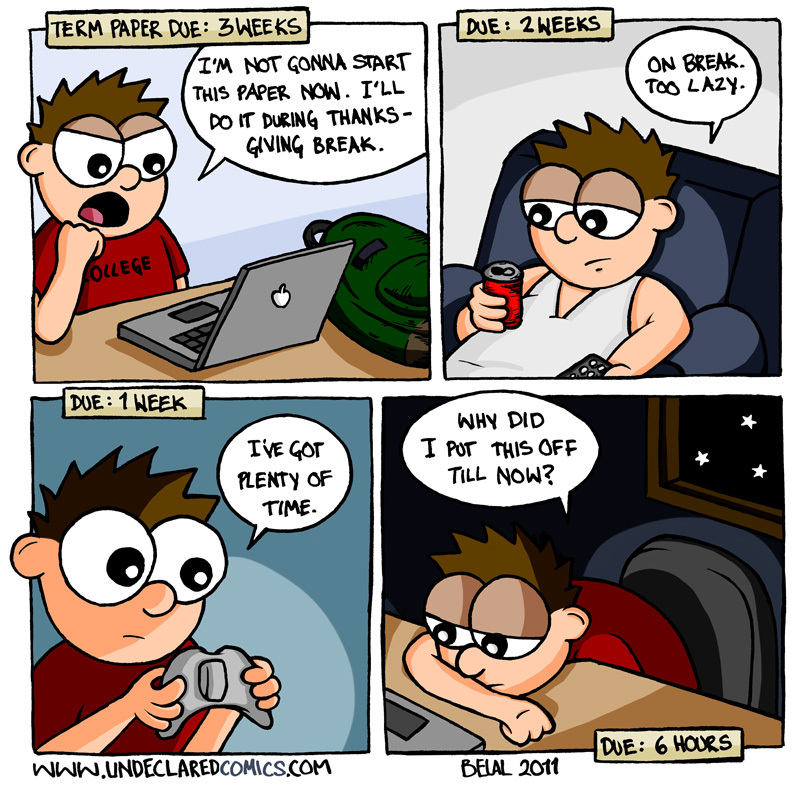 This comic just rings so true. ay my papa for lincoln university be due and i went to da libray to type dat shyt. any yall wanna hook a brutha in need wid a lappytop? ya feelme? I can’t even understand you. I began doing my paper four hours before it was due. It is the monday after thanksgiving and my paper was due eleven and a half hours ago and need five more lines to complete it. I was looking for some quotes to fill the space and began surfing the web when I came across this by happenstance. Welcome, you are among procrastinators. That is soooooooooooo me. Everytime. World’s best procrastinator, paper was due a month ago and i just finished it (thank god my professor loves me). all i have to say in response to this horrible delay is…I got Skyrim. Damn you video games and internet!!!! !